Healthy Vegan Popsicle Recipes | all you need for summer! 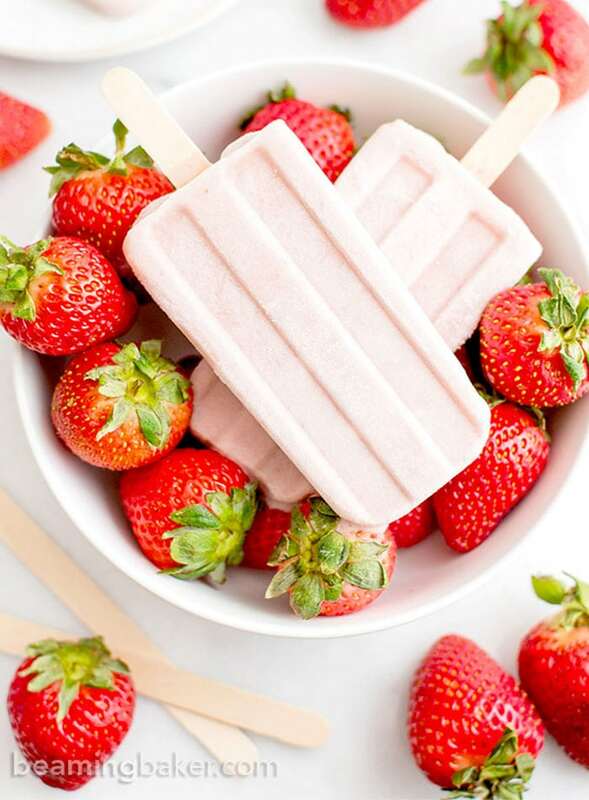 Making healthy vegan popsicle recipes at home is very easy and a great way to cool off in the summer or just enjoy as a healthy dessert year round. Making your own popsicles is fun for both kids and adults and you can even making boozy pops if you’re feeling crazy! Everything on this list is dairy-free and vegan except in the case where honey is used a sweetener, if so, simply substitute maple syrup or agave syrup. Almost all the recipes are very simple to make with minimal ingredients as I wanted to include recipes I’d actually make myself. There are definitely some more elaborate popsicle recipes out there as well as some not so healthy ones but we’ll leave those for another day! I’ve listed my recommendations for popsicle molds at the end of the post so you can get started making healthy popsicles asap! The only hard part is deciding what recipe to start with. Most creamy popsicle recipes will call for full-fat coconut milk as their base and I’ve included a ton of amazingly delicious and simple coconut milk-based popsicle recipes. You’ll also find a selection of fruity popsicles as well as popsicles made from a base of banana. Let’s get into it! 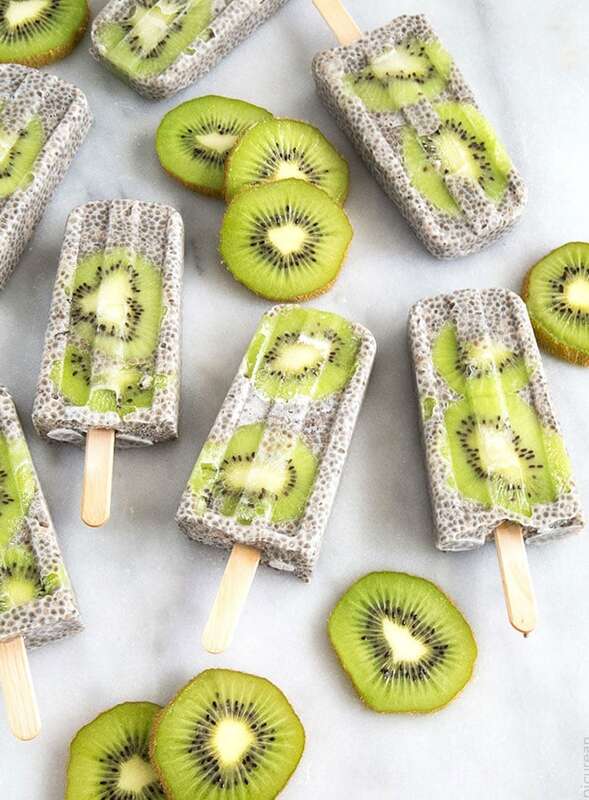 The first category of healthy vegan popsicle recipes we’re getting into are the ones made with coconut milk. Coconut milk is the perfect base for healthy, creamy, frozen desserts. Canned coconut milk is easy to find, works well with just about any other flavour and you can’t get any easier than opening a can. If you’re looking for a low-fat and fat-free popsicles head down the fruit popsicle and banana-based popsicle sections. Quick note on coconut milk: I’ve made popsicles with light coconut milk but they get a bit icy so I’d definitely recommending using full-fat coconut milk to make frozen desserts. The higher fat content makes it freeze beautifully and it doesn’t get the ice crystals that light coconut milk does. Coffee-lovers will definitely want to put these Coffee and Coconut Milk Popsicles by Feeding Your Beauty on their must-try list! These popsicles are vegan, paleo and sweetened naturally with medjool dates, they’re refined sugar free. 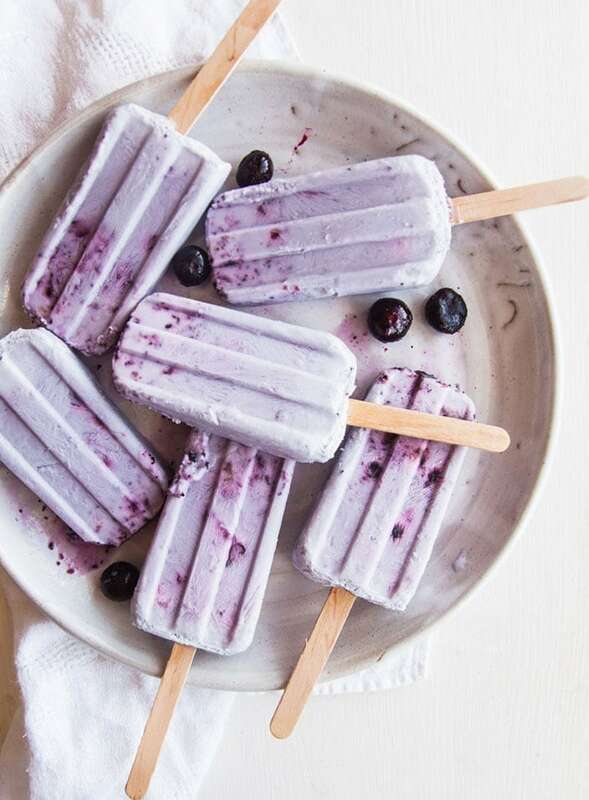 These Blueberry and Coconut Smash Popsicles from Wallflower Kitchen are about as easy as can be to make. All you need is coconut milk, sweetener and blueberries. It could be debated whether or not Oreos are healthy but what’s health without a little balance? I couldn’t leave these beauties by The View From Great Island off the list. 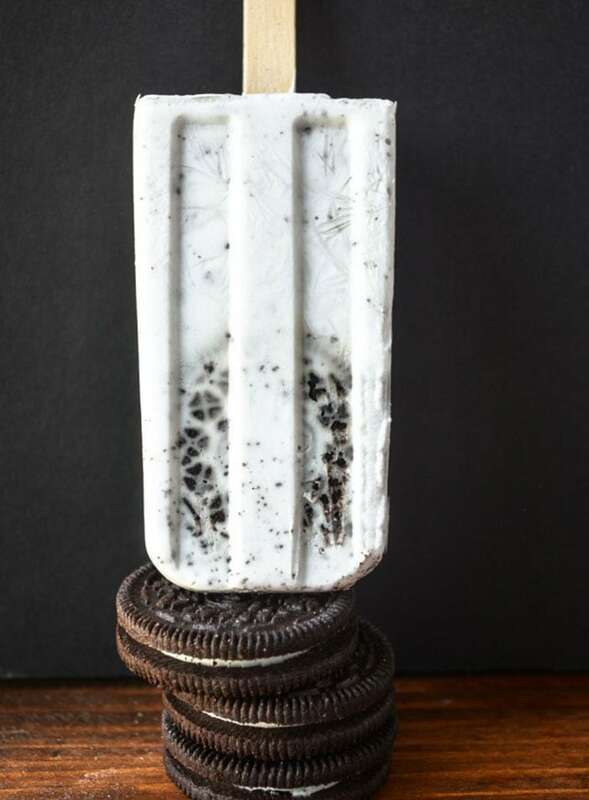 Guys, there’s an Oreo IN the popsicle. I’m making these asap. You know these absolutely gorgeous fudgesicles from My New Roots are made with only the best ingredients. We’re talking cashews, coconut milk, avocado, cacao powder and dates. Can you imagine how creamy and amazing these must be? Plus, Sarah has loaded them up with beautiful toppings like cacao nibs, toasted nuts and coconut. You can’t beat lime and coconut together for a refreshing and delicious summer treat! 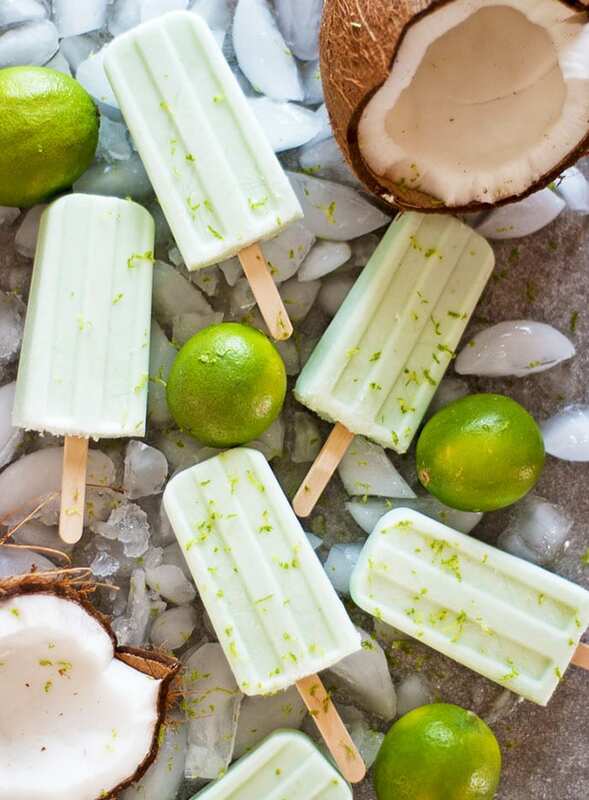 I can’t wait to try these Coconut Lime Popsicles from the Charming Detroiter. Now these are just plain mean. 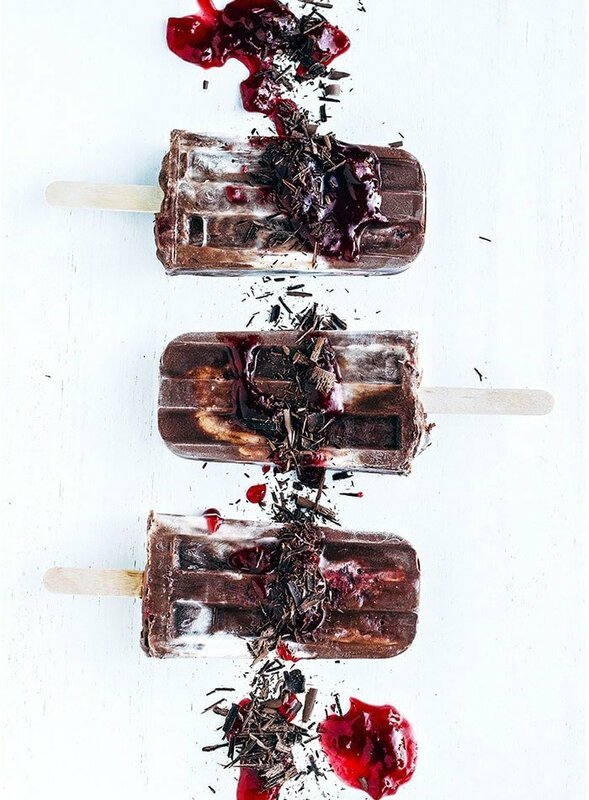 Black Forest Cake in dairy-free popsicle form? The Artful Desperado knows what’s up. These are so beautiful and look absolutely delicious. 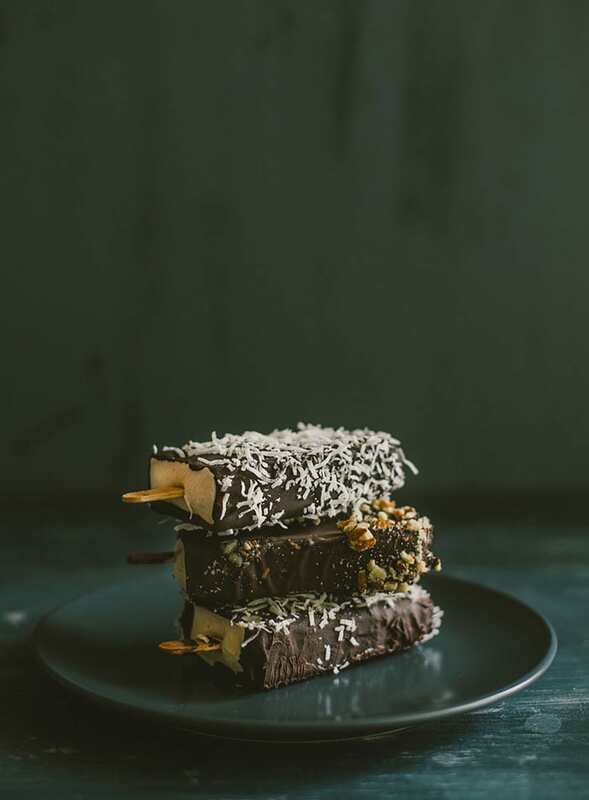 Avocado is one of my favourite sneaky dessert ingredients and what better way to use it in dessert than in these Coconut Avocado Popsicles from The Little Epicurean. All you need is avocado, coconut milk and agave and if you want to make the chocolate coating, some dark chocolate. These beauties from Coffee and Crayons are a little more involved than the rest of the recipes but they’re just so beautiful they had to be included! Plus, don’t they totally remind you of something from the ice cream truck as a kid? The ingredients are still minimal, simple and wholesome and you could certainly skip the roasting but it sounds like the roasted peach and cherry really takes these to the next level! Okay, there’s been too much fruit on this list and not enough chocolate. 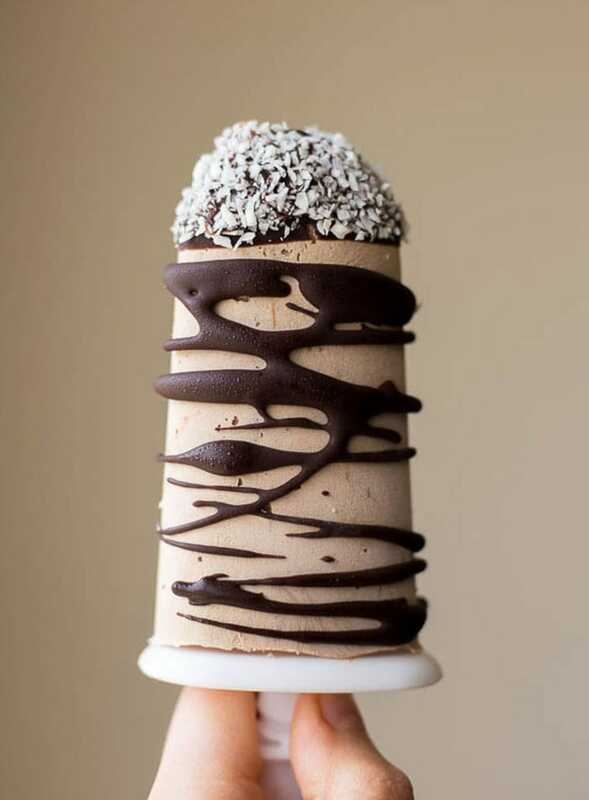 Let’s get into some more chocolate popsicles starting with these Mocha Coconut Frappe Pops from Fudduzzi. These are so pretty and sound so, so good. You’ll need a can of full-fat coconut milk to make the coconut cream base, from there it’s just sweetener, coffee and cocoa powder. These are just too fun not to try! The Little Epicurean wasn’t even going to post this recipe but when people went crazy for the photo, she did. And we thank her for that! 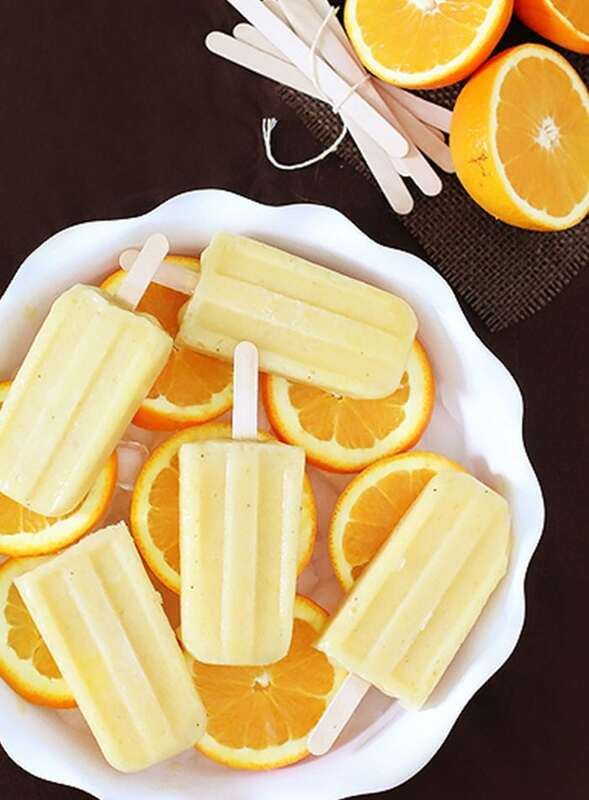 No popsicle list would be complete without an orange creamsicle. 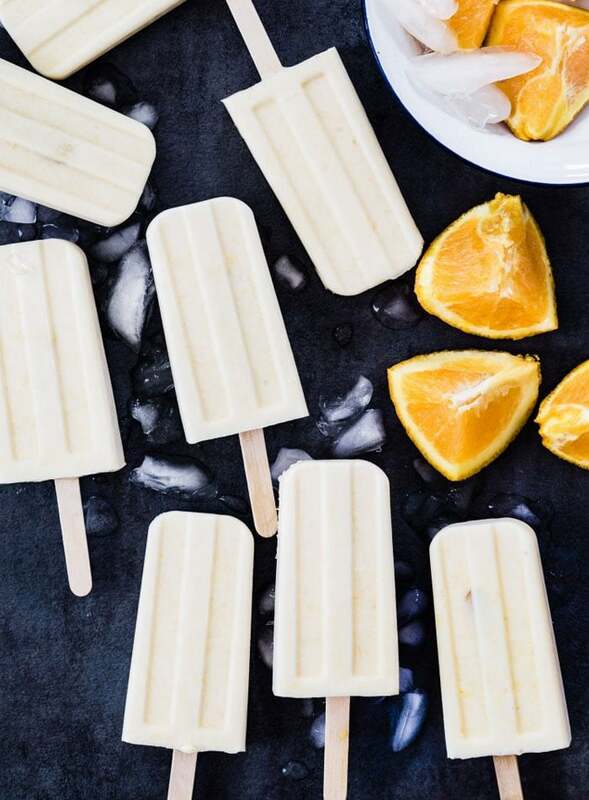 These vegan orange creamsicle popsicles from Eats Good 4 Life are made with just 4 ingredients: orange juice, whole oranges, coconut cream and maple syrup. Pure and simple! Banana and coconut might be one of my favourite flavour combinations ever. 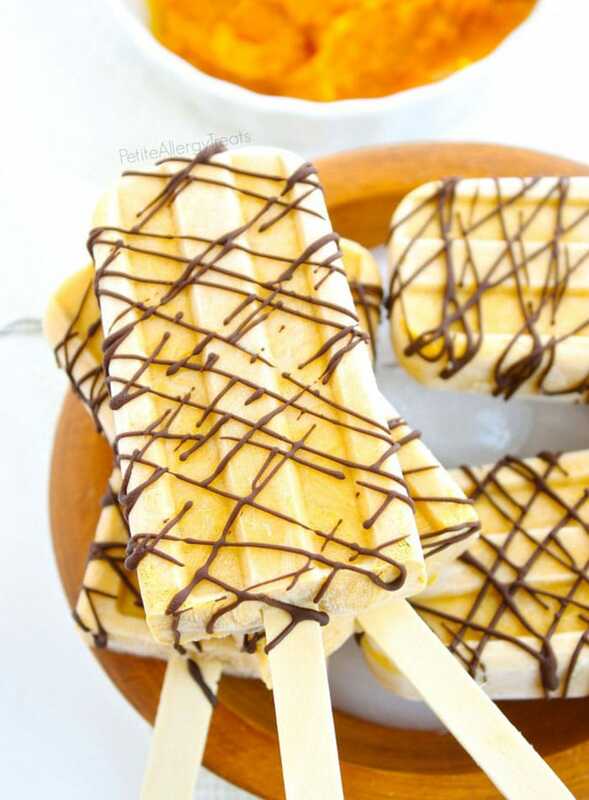 These Banana Coconut Cream Popsicles from Spoonful of Flavour are made with coconut milk, banana, natural sweeter and shredded coconut for double coconut flavour. 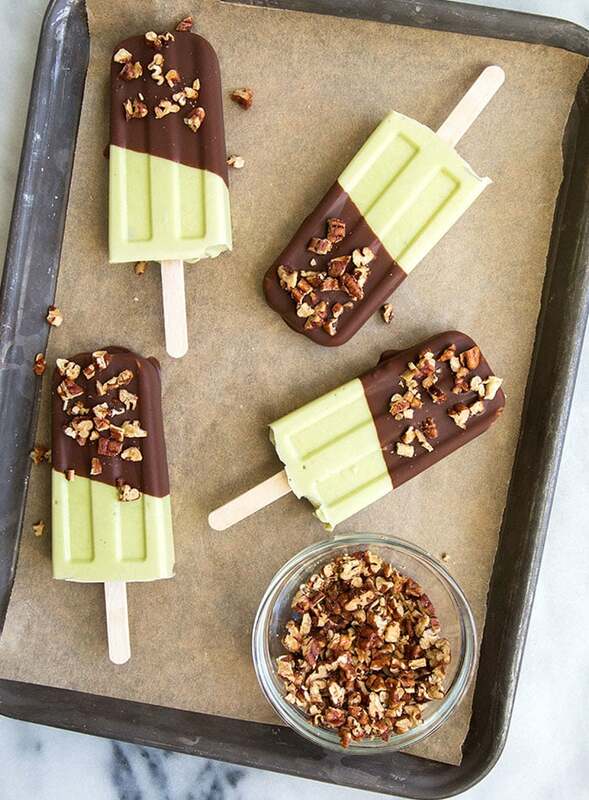 These creamy popsicles from Beaming Baker are made with both coconut milk and banana for extra, extra creamy goodness. Plus, strawberry and banana work perfectly together, especially when paired up with coconut. I’m definitely a fan of eating pumpkin year round. Who said it can only be enjoyed in the Fall anyways? Bring pumpkin to summertime with these healthy Pumpkin Pie Popsicles from Petite Allergy Treats. 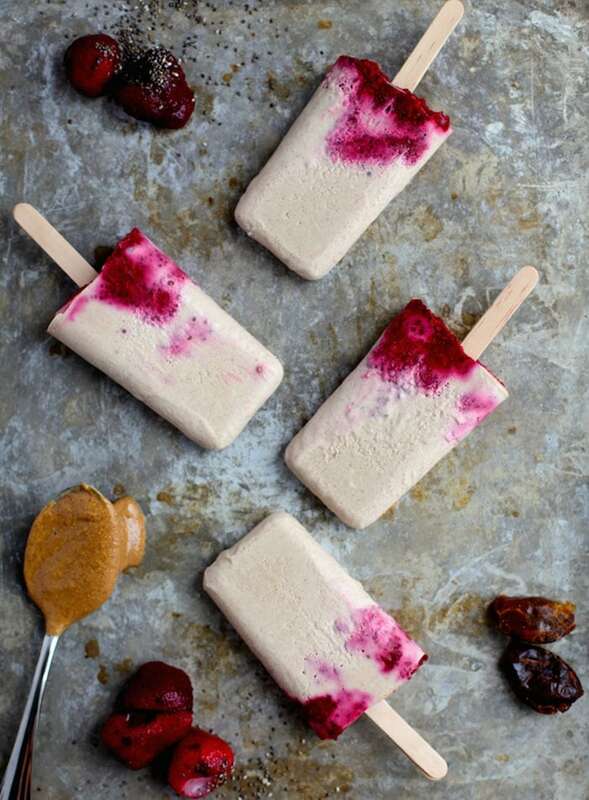 I couldn’t pass up including these PB & J pops from my girl over at Nutritionist in the Kitch. Coming from Christal’s blog you’ll know it’s good stuff. All you need to make these most delicious creations is coconut milk, chia seeds, berries, peanut butter and 1 date for sweetening. YUM. These popsicles from Souvlaki from the Soul are actually made from a base of soaked raw cashews instead of coconut milk but I wanted to include them as an alternative to using canned coconut milk. If you skip the chocolate coating you only need cashews, banana and sweetener to make them otherwise, go all out and layer these babies in dark chocolate. 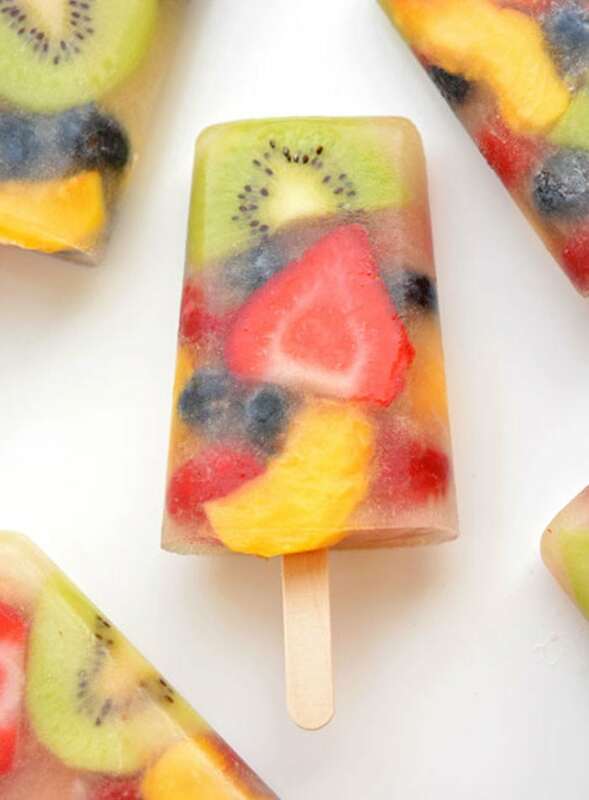 Fresh fruit popsicles are a delicious and low-fat alternative to the creamy coconut recipes above. You can make hundreds of different flavour combinations and it’s a great way to sneak some extra nutrition into your diet while enjoying a tasty treat! These Fresh Fruit Popsicles from One Little Project call for two ingredients: fresh fruit and apple juice. You can make them with whatever fruit or fruit juice you’d like and they’re so pretty and fun, everyone will love them. 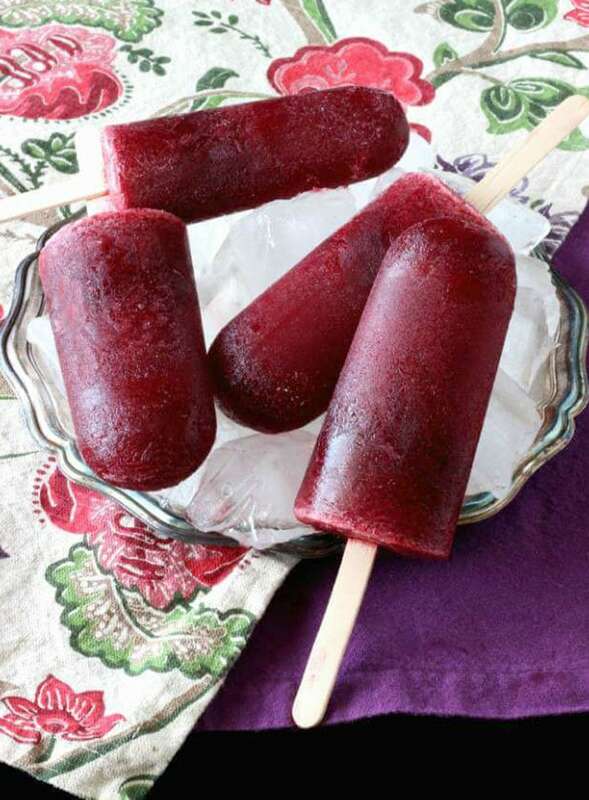 I was wondering if you could make popsicles with kombucha and then I came across these Berry Kombucha Popsicles by Wholesome Pattisserie and my question was answered. Yes, yes you can and I can’t wait to try these. 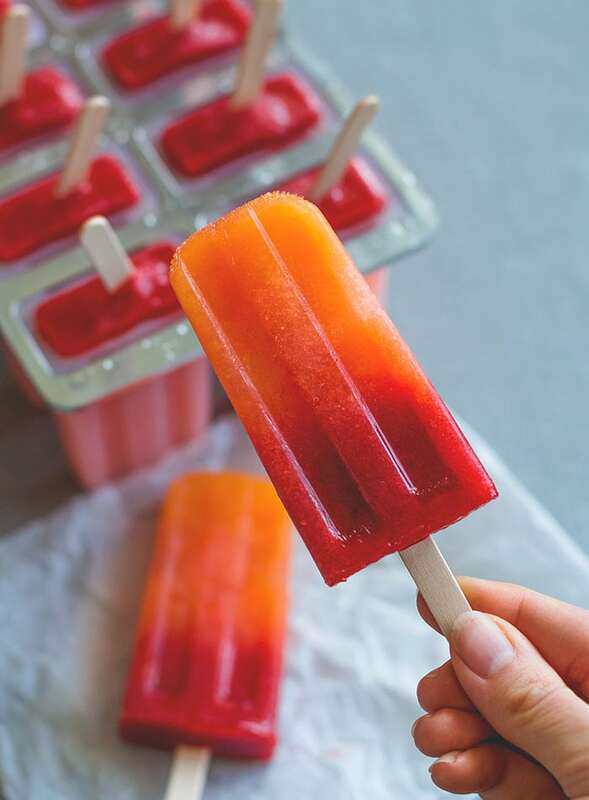 These Orange Strawberry Sunrise Popsicles from The Healthful Ideas remind me of what you’d get from the ice cream truck. They’re bright and fun but with no scary artificial colours involved! The name says it all. All you need to make these Pineapple Orange Banana Popsicles from Gimme Some Over is well, pineapple, orange and banana. I want these for breakfast! 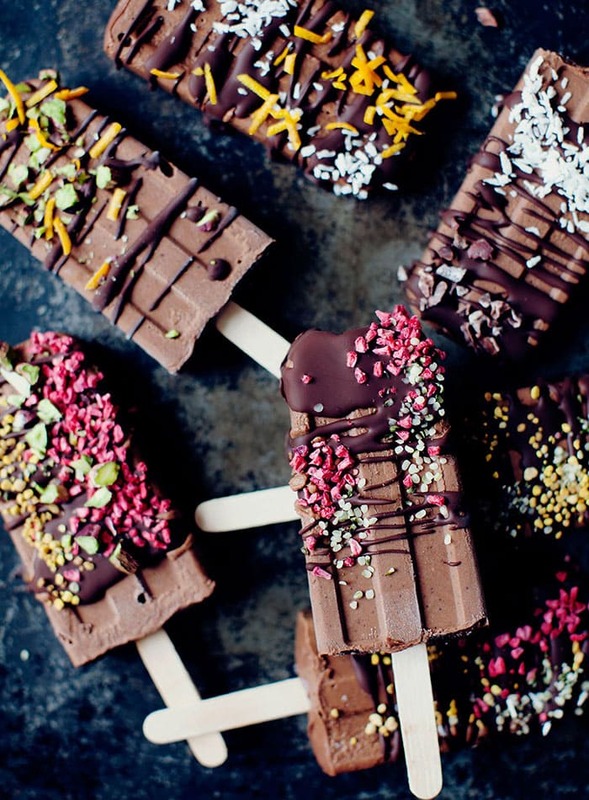 These healthy popsicles by Brita Britnell are too pretty to look at it might be hard to eat them. Nah. It’ll be really easy to eat them, who am I kidding? 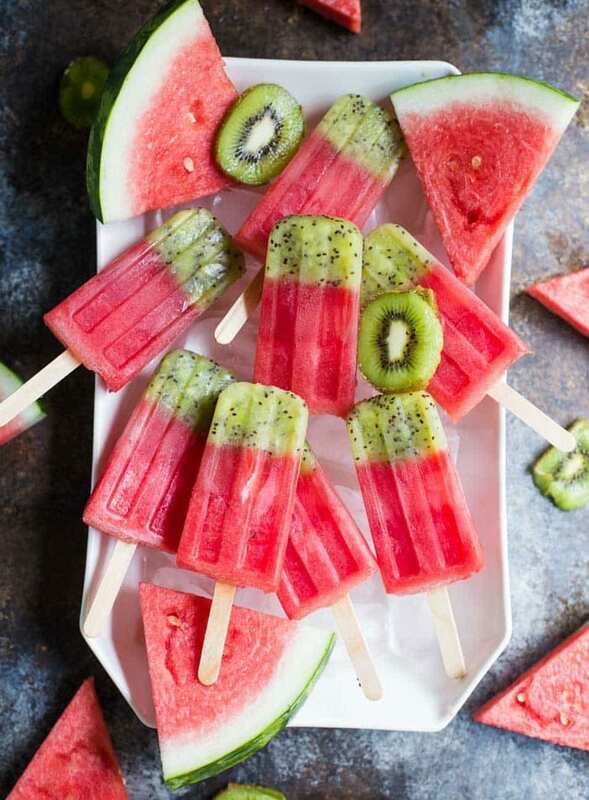 Plus, all you need is kiwi and watermelon. No added sugar, just pure fruity goodness! 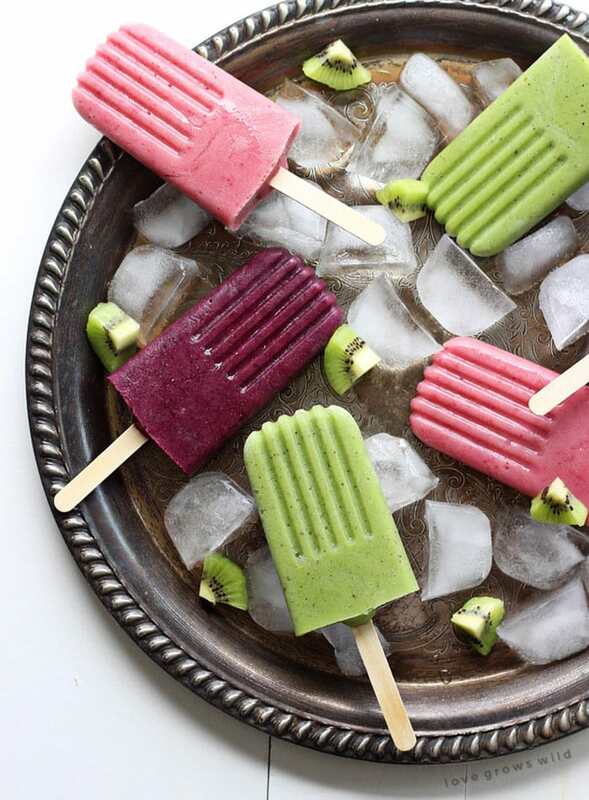 I love this idea for Smoothie Popsicles from Love Grows Wild. Basically, make your favourite smoothie, pour it into popsicle molds and you’re done! Since we’re talking healthy vegan popsicle recipes, I figured I better include something with veggies in it. 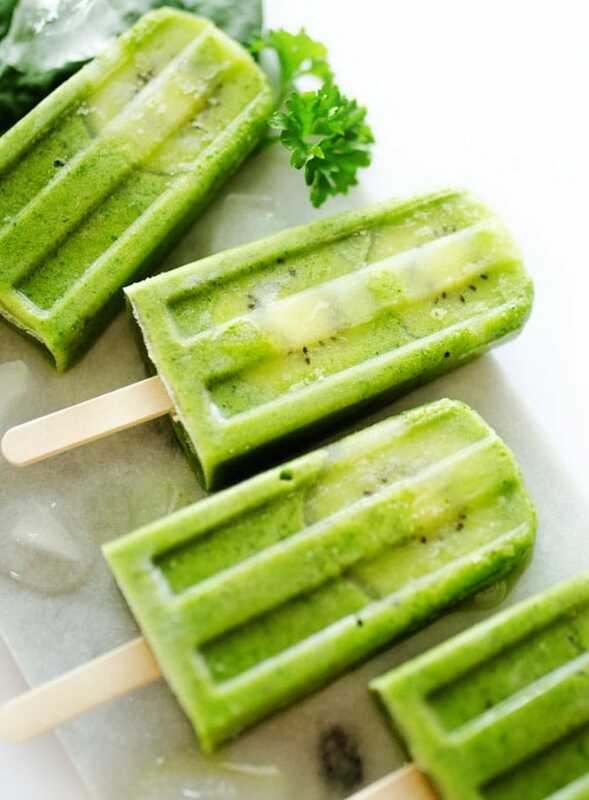 These Green Smoothie Popsicles from Live Eat Learn are made with spinach, parsley and fruit for a bright, beautiful and nutrient-packed summer dessert. 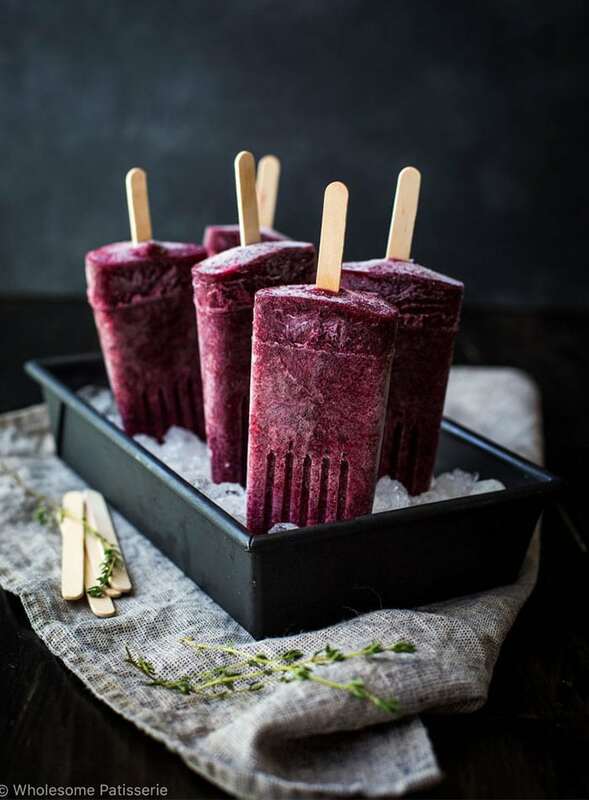 These Blackberry Apple Popsicles from Vegan in the Freezer call for just 3 ingredients: apples, blackberries and apple juice, and they look perfectly refreshing on a hot summer day. I can’t wait to try these ones! 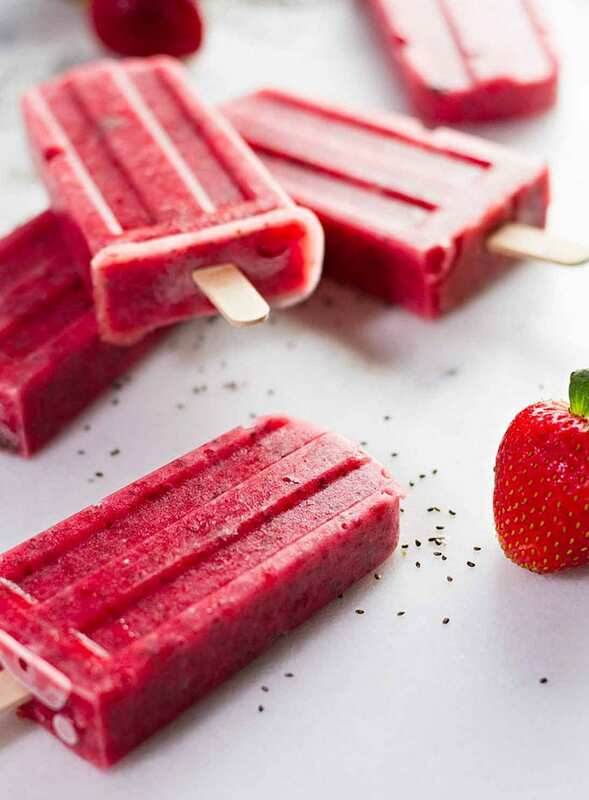 You guys know I love my chia seeds so, no surprise, I’ll be making these Strawberry Chia Seed Popsicles from Jar of Lemons asap. How fresh and fun, plus just 3 ingredients needed! 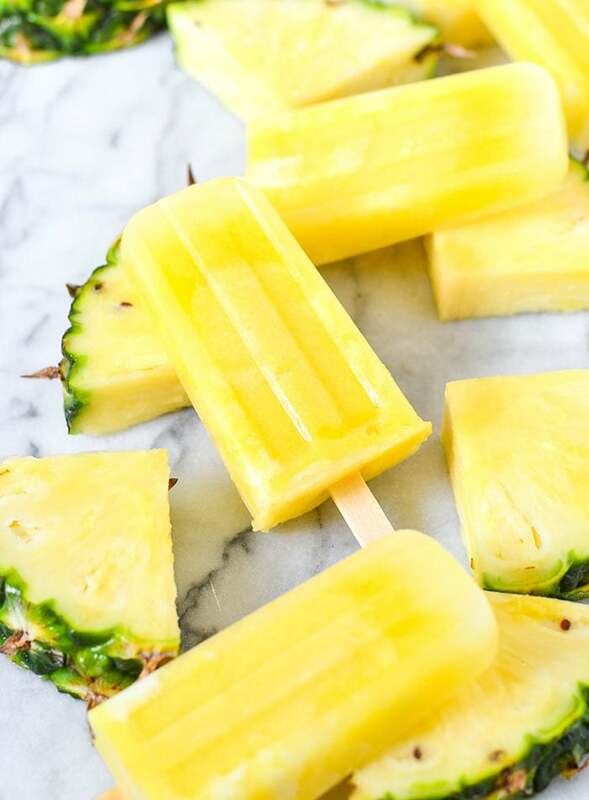 All you need to make these bight and beautiful Lemonade Pops from Courtney’s Sweets is fresh pineapple and lemon. You can’t get any healthier and more refreshing than that. Unless you’ve been hiding under a rock or don’t do social media, you’ve most certainly heard of “nice” cream. Nice cream is ice cream made by blending frozen bananas and no surprise, bananas work just as well for healthy vegan popsicles. 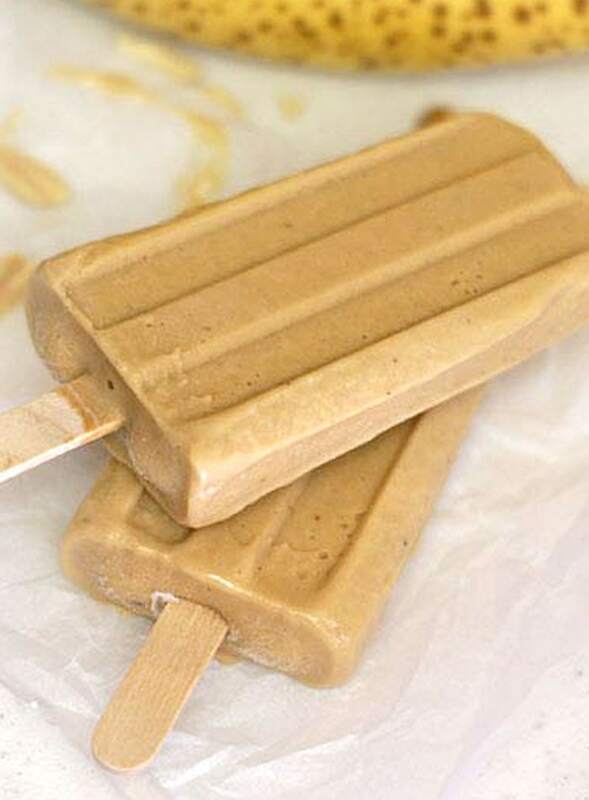 Banana and peanut butter, together as they should, no in healthy peanut butter banana popsicle form! 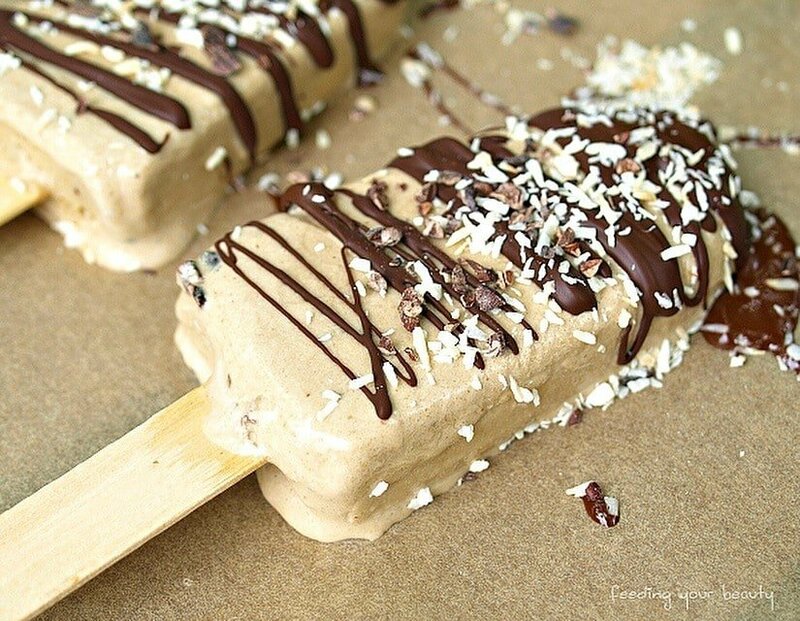 These PB Banana Pops by Detoxinista are super easy to make with just a couple ingredients and make an awesome healthy dessert for peanut butter-lovers! 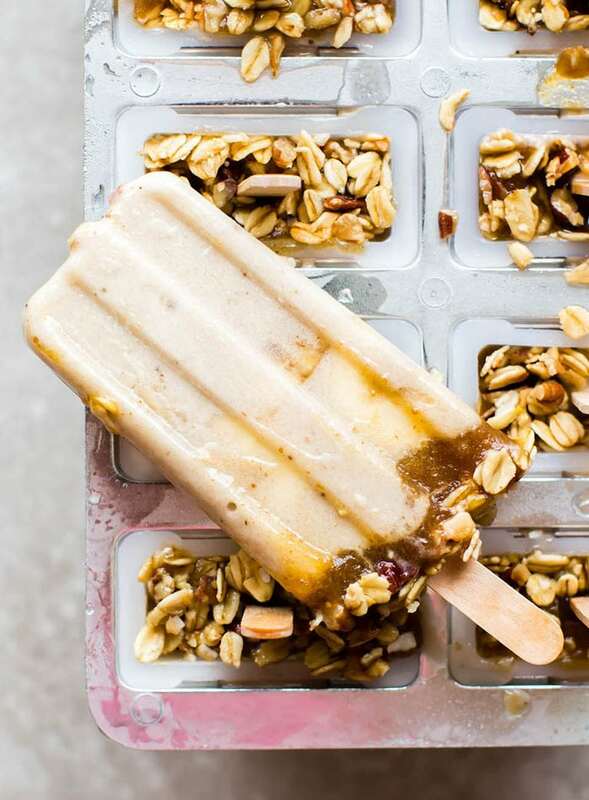 Banana, caramel, granola…why wouldn’t you make these Banoffee Ice Cream Pops from Feasting on Fruit, or as she calls them: summer on a stick. Sign me up. 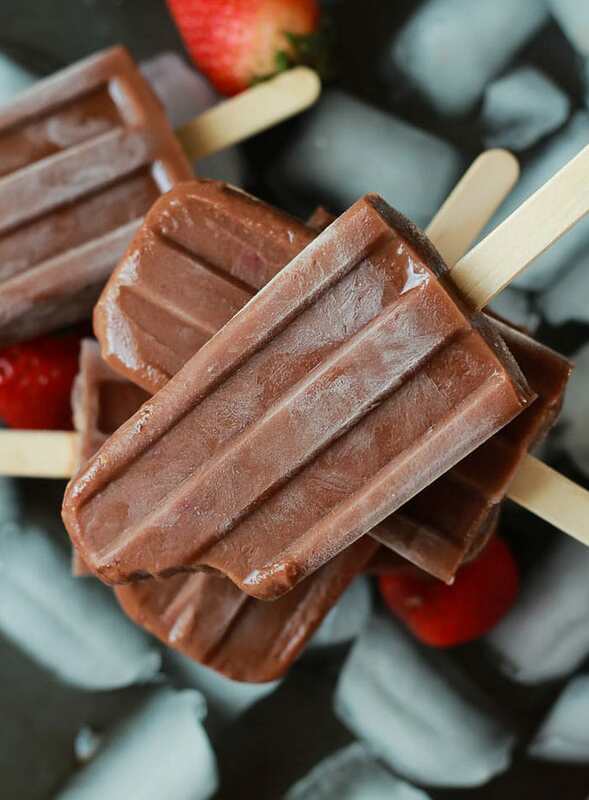 You’ll need banana, strawberries and cocoa powder to make these banana split-inspired popsicles from Joyful Healthy Eats. Substitute maple syrup or agave for the honey to make them vegan. 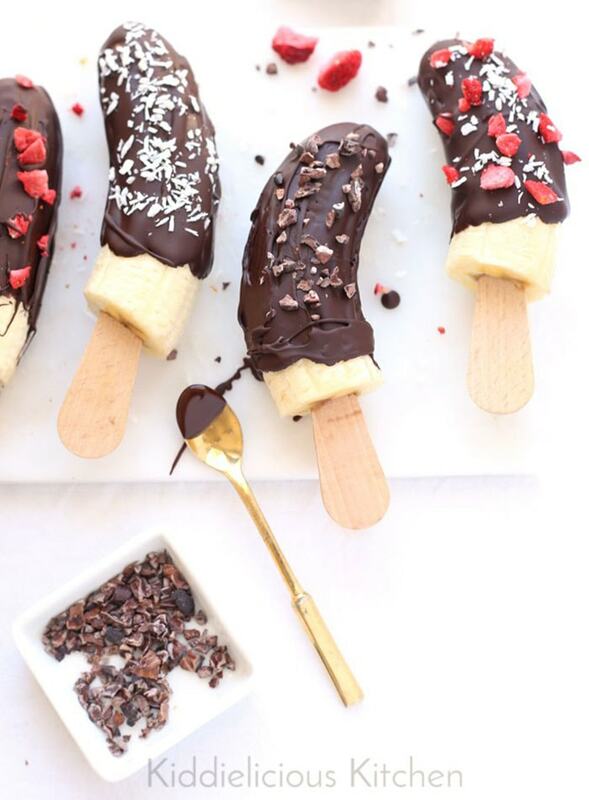 Feasting on Fruit is at it again with these banana-based Chocolate Almond Sea Salt Popsicles. So simple and so, so good! 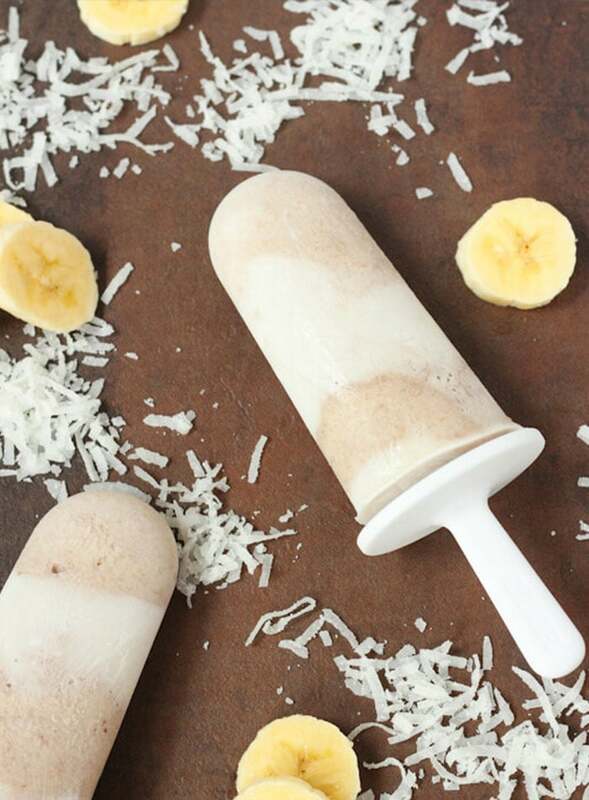 Of course I had to add the simplest of banana popsicles to the list: actual frozen bananas! 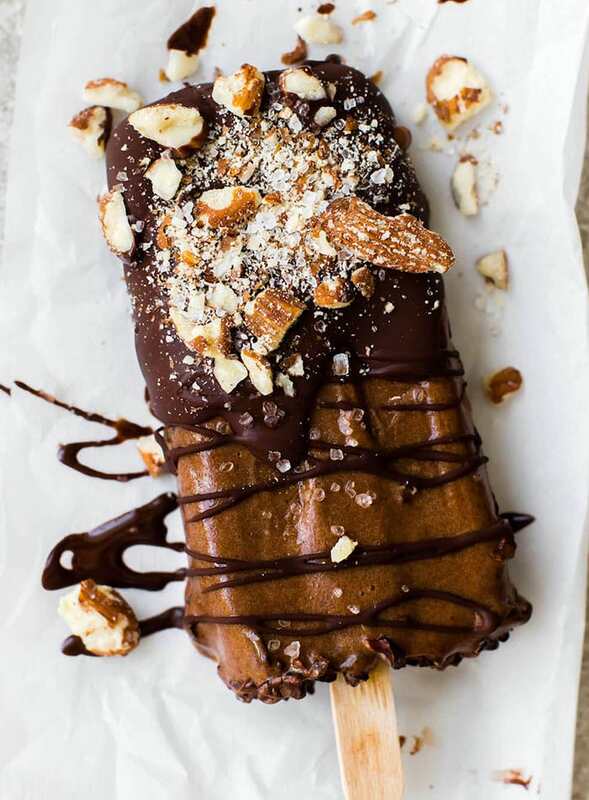 All you need to make these chocolate-covered banana pops are bananas and chocolate. Once you’ve dipped the bananas in melted chocolate, load them up with toppings like coconut and cacao nibs, plus the other yummy suggestions from Kiddilicious Kitchen. Alright, now you’ve got the recipes, ideas an inspiration. Now you need the supplies to make them! No worries though, all you need is a popsicle mold and some sticks depending on what type of mold you get. Find my suggestions on Amazon below and hop to it. We’ve only got so much Summer to work with! 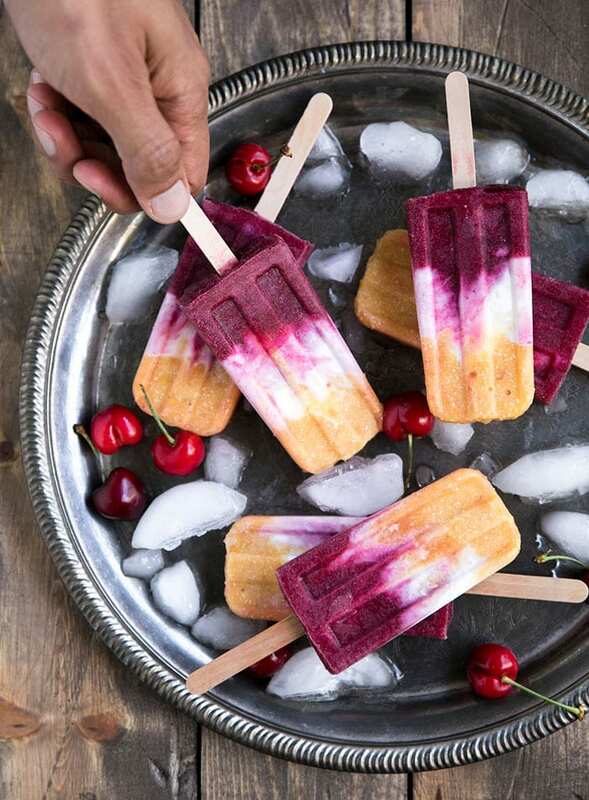 To get going on these recipes, head over to Amazon and pick up what you need to start making Healthy Vegan Popsicles at home! If you love frozen desserts, check out my Ultimate List of Vegan Ice Cream Recipes. 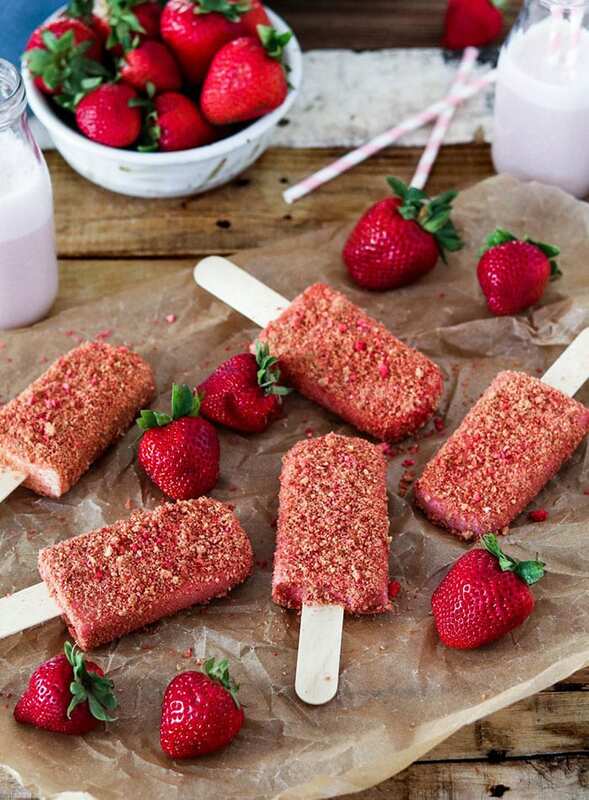 For your convenience, I’ve added all these recipes to my Healthy Vegan Popsicles board on Pinterest, so check that out and don’t forget to follow me as I’ll be adding any other healthy popsicle recipes I come across. A huge thanks to all the amazing bloggers who I’ve included in this post. We love you! That’s a lot of amazing popsicle recipes for the summer! I love that it includes fresh fruits! I also enjoy citrus fruits the most during this season! I can’t wait to try these!